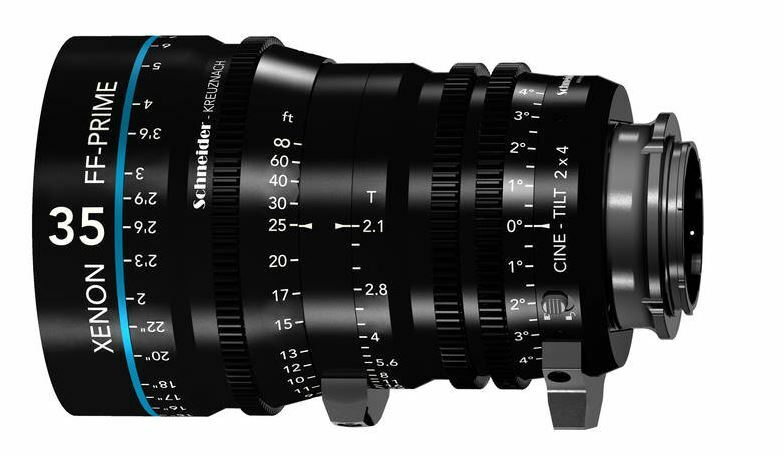 Schneider Cine-Tilt Xenon lenses announced just ahead of the BSC Expo. The unique new design incorporates a new tilt mechanism ring at the back of the lens. Schneider is well known for their stellar Xenon cine primes, and with the added new unique functionality, the new Cine Tilt primes are sure to interest lots of cinematographers. These groundbreaking new Xenons combine a similar form factor and capabilities as the popular Xenon full-frame primes, however this time they come with an added tilt function up to ±4°. By sustaining the field of view during focus and tilt actions, the new cine-tilt design means that previously unimaginable images can be taken by moving and tilting the focus plane. The new lenses make it possible to capture out-of-focus areas in the frame, especially when using tilt with a large aperture. A 4° tilt angle on the sensor plane corresponds to an 80° focal plane, which varies according to the selected focal length and aperture setting. Like Schneider-Kreuznach’s standard Xenon FF-Primes, the new Cine-Tilt Xenons are great for the latest 4K capture provided by pro camcorders like the Sony FS7 II due to their lightweight and compact, uniform housing. The colour-matched lenses feature minimized breathing and a "bokeh" reminiscent of classic Hollywood. Designed and built in Germany, the new design incorporates sophisticated mechanics for smooth and accurate tilt action. The tilt of the lens is controlled via a high-precision ring with 120° rotation that is as intuitive to operate as pulling focus. Thanks to the common 0.8 module gear, the Cine-Tilt can be used with standard follow-focus systems. In this case, the Cine-Tilt Xenons provide identical images to the standard FF-Primes. The Xenon Cine-Tilt are available in the same focal lengths - 25mm, 35mm, 50mm, 75mm and 100mm – all with a bright maximum aperture of 2.1. The new Schneider Cine-Tilt FF-primes will be available in a Sony E-mount and start shipping sometime in the Spring. As stated before, these will be the perfect addition to the new FS7 II. There is no official UK pricing yet.